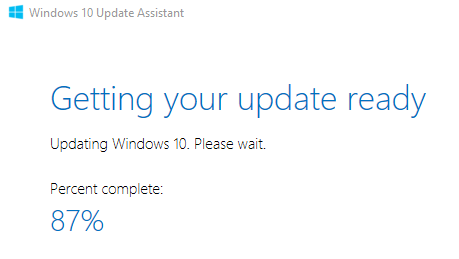 From a logical standpoint, why would Microsoft not integrate the Windows 10 Updates into the settings application or vice versa; getting rid of the Update section of the setting application and having us use the Windows 10 Upgrade Assistant? It's very likely that I'm overthinking this, or that I'm missing something blatantly obvious, but I would appreciate any suggestions/guidance. 1709 showed on my computer Tuesday evening and installed just fine using the standard Microsoft Update mechanism. To ease load and to minimize issues, Microsoft does stagger the availability of their major releases. Using the Upgrade Assistant will generally circumvent this staggering and will get you the latest major version right away. Couldn't finish my windows update? Why does Windows 10 “Update and shut down” not complete the update? What can defer a windows 10 update besides the update channel and the number of defer days?